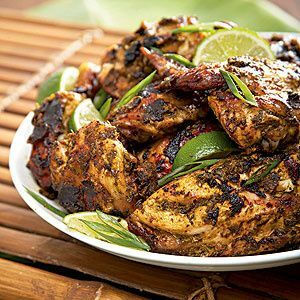 If you’re thinking Caribbean and spicy, then truth be told, you’re thinking about Jamaican jerk seasoning. While probably every island claims some variation on the theme, this is arguably the root of that wonderful recipe tree. The combination of chile heat, with a spice mélange often only associated with deserts makes for an unforgettable taste treat. There are dry and wet variants of the style; the wet marinades and an oven bake, like the one we’ll do here, add a greater depth of flavor to your dish. Dry rubs are great too, and especially lend themselves well to grilling. You can use either variety on chicken, beef, pork and fish. For my mind, chicken is the quintessential jerk dish, so that’s what we’ll do here. Though it may seem like there are a lot of ingredients, don’t get intimidated; this is a pretty fast process and well worth the effort. You should plan on allowing at least 3 hours for marinating, though you certainly can let things sit overnight and should whenever you have the chance. Note the great range of potential heat indicated in the recipe – I think you need at least two habaneros to get the heart correct for this stuff, but some folks like or require far more to float their boat. If you’re a neophyte, start conservative – While habaneros aren’t the hottest thing out there, they’re plenty potent enough to really sear you if you’re not ready to handle them. Add rum and a couple of tablespoons of water to a sauté pan over medium-high heat and simmer until the alcohol is burned off. If any of your spices are whole, combine them and run them through a spice grinder until evenly blended. Pour rum into a blender along with the vinegar, onions, garlic, habaneras, allspice, pepper, cinnamon, ginger, nutmeg, salt, sugar, and thyme. Squeeze the juice from both limes in as well. Blend thoroughly until you have a nice, smooth consistency. Take 2 Tablespoons of the seasoning blend and transfer to a small glass bowl. Add the ketchup and soy sauce and blend thoroughly. Cover and set aside until you’re ready to serve. Cut up chickens into appropriate cooking size, (Quarters or better as you please). Place chicken in a glass dish or bowl, (Gallon ziplocks will do if you don’t have a decent sized glass dish), and pour the jerk marinade in. Thoroughly coat the chicken on all sides with the marinade, massaging it in so it covers completely. Cover the container and refrigerate for at least 3 hours and up to overnight. Remove chicken from marinade but leave a nice coating on each piece. Cook to an internal temperature of 165° F, remove from oven and allow to rest for 5 to 10 minutes. Serve with rice and black beans, Johnny cake, a fresh mango salsa, or a nice cole slaw, with plenty of ice cold Red Stripe! Here in the Great Pacific Northwet, it’s beginning to look like maybe, just maybe, it’ll stop raining one day. As such, it’s time to think about grilling again. When we do that, there’s a veritable cornucopia of cool things to do with the stuff we grill, like brines, marinades, rubs, and glazes. First things first, though – Time to clean and inspect your grill, before you light the fires – Here’s a pretty good primer for that. Next question, how are you grilling? In a big way, the answer to that question will determine what to do before your food hits the fire. Grilling is, for most of us, far less controlled than cooking in an oven or on a stove top. As such, knowing how to properly set up a charcoal grill, or use a gas one, makes a big difference to your end results. The back end of this Char Siu post has clear directions for setting up a two zone charcoal grill. Brines, marinades, rubs and glazes will all contribute to the food we grill, especially proteins and veggies. Some of those contributions will alter proteins by tenderizing, or add moisture to help foods that tend to dry out in high heat stay juicy, and all these potions can add big flavor punch when you want or need it. What’s best depends on what’s cooking. Brining is, in simplest term, utilizing a salt solution to add internal moisture to foods that have a tendency to dry out when grilled – It’s also a great way to add some subtle flavor notes from herbs and spices. Poultry, pork, and firm fish like cod, salmon, and swordfish do especially well with a brine. This little primer will give you some great base knowledge and ideas. Marinades combine an acid and a base, just as we do for vinaigrettes. Marinating can take anything from a few minutes to days, depending on what you’re working with. Marinades generally carry bolder flavor profiles than a brine does, although those flavors may or may not get as deep into a protein, veggie, etc, depending on how long they work. Beef works great marinated, as do some of the gamier meats like lamb, game, and field poultry. A general search on the site here will provide a bunch of options from which you can springboard to your own thing. A rub can be either dry or wet, and is what it sounds like – Where marinades are meant to get deeper into the meat somewhat as a brine does, rubs sit on top and do their work right there. Salt and pepper are most common, and fact is, if you’ve got a really lovely fresh protein or veggie, may be all you need or want. More stuff can certainly be added, and doing so can help a bunch in forming a nice crust on your food, and sealing in moisture on that relatively hot grill. Here’s a bunch of ideas to get you started. Finally, we’ve got glazes. Generally speaking, glazes employ some sugar or an analog, and maybe some fat, like butter, which are integral to making things stick to your food. They also are quite prone to burning, however, so glazes are generally done last, and watched closely to make sure they do their thing properly. M came home with some incredibly pretty local pork chops, which prompted this whole post. I decided to wing a sweet and sour glaze for those bad boys – Here’s what I came up with. Combine all ingredients in a non-reactive mixing bowl and whisk to incorporate thoroughly. Allow to sit for 15-20 minutes at room temp for flavors to marry. Bast pork with glaze liberally in the last 3-5 minutes that it’s grilling, and keep a close eye on things so the sugars don’t burn. Feel free to leave some at table as well. Ah, the joy that is a velouté; say it with me now – Veh-Loo-Tay – D’accord! It’s a safe bet that a fair chunk of y’all aren’t as familiar with this giant of sauces as you’d like to be, and we’re about to fix that. Le velouté is a giant because it was anointed by the legendary Père of classic French cuisine, Auguste Escoffier, as one of the five Mother Sauces, the roots from which a host of classic French and world variants spring, (The other four, for the record, are Béchamel, Espagnole, Hollandaise, and Tomato). Velouté derives from the French ‘velour’, and speaks to the light, velvety nature of the sauce. The classic velouté combines a light stock like chicken, veggie, or fish with a blond roux as a thickener. Typically, only a little salt and pepper is added for seasoning. The light stock refers to one in which the bones, veggies or racks are not roasted prior to the stock being made – That keeps the color and flavor notably lighter. Since the sauce itself is quite delicate, it’s most often paired with the things that make up the stock it derives from – poultry, fish, or vegetables. Then come the derivates, which are too numerous to list here; the point is that a basic velouté is a jumping off point for almost endless experimentation. Add a little lemon juice, an egg yolk, and some cream, and you’ve got an Allemande. Onion, paprika and white wine yield a Hungarian. Adding mushroom liquor and cream to arrive at a Suprême, and so on. Here’s how you start. Add the butter to a heavy sauté pan over medium heat, and melt completely. Add the flour, whisk to incorporate thoroughly, then allow the roux to cook for about 2 minutes, until the blend starts to smell slightly nutty. Add the stock in a slow drizzle, whisking constantly. The sauce will start out kinda like mashed potatoes, and thin progressively as you continue adding stock. Go slow, take your time, allowing the sauce to return to a simmer before adding more stock. There’s an elastic bond formed between the fat and the flour that is integral to the finished sauce – For that reason, never dump in a whole bunch of liquid when thickening with a roux – work slowly and steadily to allow that elasticity to be retained and do its thing. The roux not only thickens, it traps tiny air bubbles formed when you whisk. The end result is a velouté that, while appearing thick, is remarkably light and airy. Once all the stock is added, reduce the heat to low and allow the sauce to cook for about 10-12 minutes, whisking occasionally. Remove the velouté from the heat and serve immediately. There’s a reason that a Saucier, (The Chef responsible for making and serving sauces, as well as sautéing dishes), is often considered one of the the highest positions in a pro kitchen, second only to the Chef and Sous Chef. And frankly, whatever the cuisine, a great sauce is key to many a dish – From Italian to Indian, Mexican to Moroccan, sauces rule, and for good reason. A great sauce elevates a dish, enhancing and highlighting rather than overpowering. Take, for example, the wonderful, fresh tomato sauce in which a Oaxacan style chile relleno is floated – Without that, it’s a good relleno, but with it, it’s a dish of complex, sublime beauty. Arguably, no sauce does a better job at this than a velouté – The lightness of stock and the richness of a thickener combine in a way few others can or do. That classic velouté is important to try and to keep in your quiver for when you might need it – It’s deceptively simple and quick. That said, there’s more than one way to skin a potato – Who says that, in your own kitchen, you must follow some rigid set of rules when it comes to sauce? Let’s say you sautéed a chicken breast, and while its resting, you’re wondering what might make a nice finishing touch. Add a couple tablespoons of butter to that sauté pan, let it melt, then pull out some chicken stock, and add that. Whisk to incorporate, and let everything come to a simmer. Now, shake in a little Arrowroot, (a powdered root made from any one of a number of tropical plants), that is a potent yet quite transparent thickener. A dash of salt, a twist of pepper, and you’ve got what many would call a pan sauce, (it is), but as far as I’m concerned, you would not be at all out of line to call it a velouté, (which sounds far sexier, doesn’t it?). Put on your best Eric Ripert accent and call it that – Who’s to argue with you? The bottom line is that a velouté is, fundamentally, thickened stock. You can arrive at that end result any way you see fit. Corn starch will work, as will modern, molecular gastronomy versions like Ultra-Sperse 3. That product, made by Modernist Pantryu, is a ‘all-natural cold water swelling starch’ derived from tapioca. Ultra-Sperse works with cold or hot liquids, doesn’t get lumpy, and yields a remarkably smooth finished product with virtually no added or off-putting flavor notes. It works quickly, has amazing stability, and is genuinely fun to play with, (And for the record, no, I am not sponsored by or in league with Modernist Pantry, I just like their stuff a lot). I tend to use either Arrowroot, which I keep in a shaker top bottle above the stove, or Ultra-Sperse, because they’re quick, and they provide a lighter sauce than the traditional roux. And then there’s all that variety. As I noted above, adding a couple, two, three ingredients to a standard velouté creates a whole ‘nuther stable of deliciousness. Veggies, from carrot to cucumber, tomato to turnip, can be added – Then you’ve got something really special. Asparagus, artichoke, sweet corn – Whatever is fresh and strikes your creative fancy. Go farther afield and add mango to chicken stock, finish that velouté, and top fresh salmon with it. Maybe blueberries and lime with pork tenderloin – You get the idea. Grab a copy of The Flavor Bible, and come up with some new pairings of your own. If what you want to add to a velouté requires cooking, and especially for veggies, it’s best to blanch them in boiling, salty water, (no salt for fruit, of course), and then plunge them quickly into an ice water bath – That will instantly stop the cooking process, and retain all those vibrant colors – That’s important, because we eat with our eyes, right? Next, process your fruit or veggies in a blender or processor until uniformly smooth. Transfer whatever you’re saucing to a sauté pan over medium heat. Add a couple tablespoons of butter and whisk to incorporate. Add your thickening agent graduating, whisking gently and constantly. When your just shy of your desired thickness, remove the sauce from the heat. If you want to be fancy, (or if your ingredients are fibrous), run the sauce through a single mesh strainer, and then serve promptly. I wrote this piece because yesterday was Father’s Day, and our youngest, along with our dear friend Mario Young, came over for the night. M and I bought fresh local chicken breasts, sweet corn, a baguette, stuff for a lovely green salad, a couple of nice bottles of wine, and stuff to make strawberry shortcake for dessert. Then M saw some very nice looking avocados and said “what about these?” As we chose a couple, the little light bulb over my old, bald head brightened notably. Here’s what I made – And note that I took some serious poetic license with the classic velouté, and you know what? Not only is that perfectly OK, that sauce was the absolute star – Everybody raved over it, and the light, fresh taste it added to a perfect meal. On a hot grill or barbecue, slice the avocado in half, remove the pit, and place the fruit cut side down on the grill for about one minute. Gently turn the avocado cut side up and grill for another 4-5 minutes, until the meat around the edges of the skin begins to notably soften. Remove the avocado from the heat and allow to rest for a few minutes. Scoop the avocado meat into a heavy sauté pan over medium heat, then firmly mash the avocado with a potato masher or a large fork. Add the butter and whisk to incorporate. Slowly but steadily add the chicken stock, whisking steadily, allowing the sauce to heat through as the stock is added. Add a teaspoon of arrowroot and whisk steadily. The sauce should begin to thicken notably. Continue whisking, and add more arrowroot if you prefer a thicker sauce. Season lightly with salt, pepper and lemon juice. Taste and adjust seasoning as needed. NOTE: I like pepper, but you can certainly leave it out and let diners add their own. My friend, (and excellent home cook), David Berkowitz recommends white pepper here, so that you don’t get dark little flecks in the sauce – He noted that after reading the original post – As noted above, we eat with our eyes! Reduce heat to low and allow the sauce to cook for about 5 minutes – Remove sauce from heat and either serve rustic, or run it through a single mesh strainer if you prefer a smoother texture. Want to take things a step further, and create a great summer soup? Add the chicken stock and butter to a heavy sauce pan over medium high heat, and cook until the stock simmers. Remove the pan from the heat, add the arrowroot and whisk steadily to incorporate. In a blender or processor, add the avocado, basil leaves, a healthy pinch of salt, and 5-6 twists of pepper. Pulse the mix two or three times, then add a cup of chicken stock, pulse a couple of times, and repeat until all the stock has been added. Add the arrowroot and yoghurt and pulse a couple more times to incorporate thoroughly. Can be served immediately, or chilled and served cold. 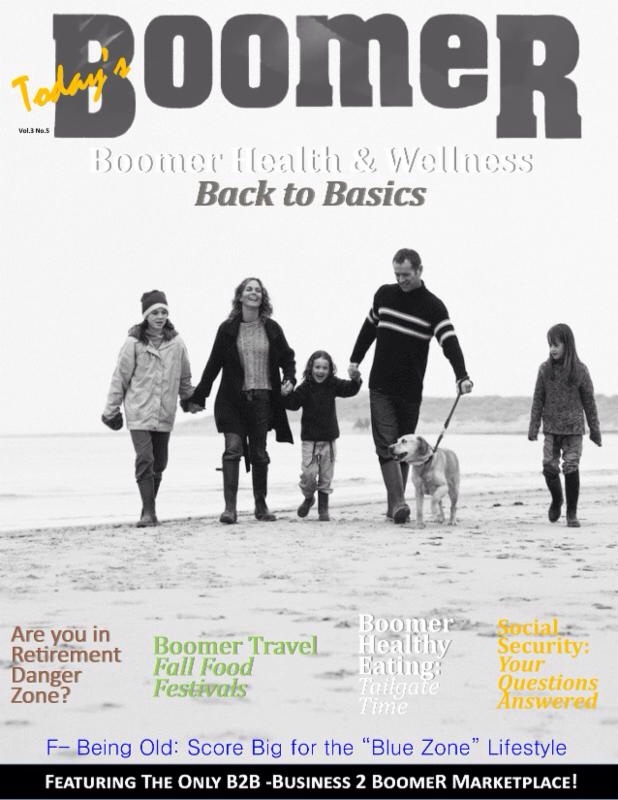 check out the fall Boomer! Sure it’s shameless promotion, but I still get a big kick out of seeing my stuff on the page in living color! Some of this you may have seen before, some not – I’ll guarantee this is a kickass meal. Posted on October 4, 2014 Author urbanmoniqueCategories Grilling, Main Courses & Meals, Outside, Salads and Sides, Shameless Promotion DepartmentLeave a comment on check out the fall Boomer!